Steinway Model D instrument pack for the Pianoteq virtual piano. Authorized by Steinway & Sons, the Steinway Model D grand piano is a virtual copy of a Steinway D from Hamburg, famous for its exquisite musical expression and being featured in numerous prominent recording studios and concert halls worldwide. Each note has been carefully adjusted in its finest detail, just like in a real factory. The result is a stunningly vivid instrument created with the most demanding musician in mind. 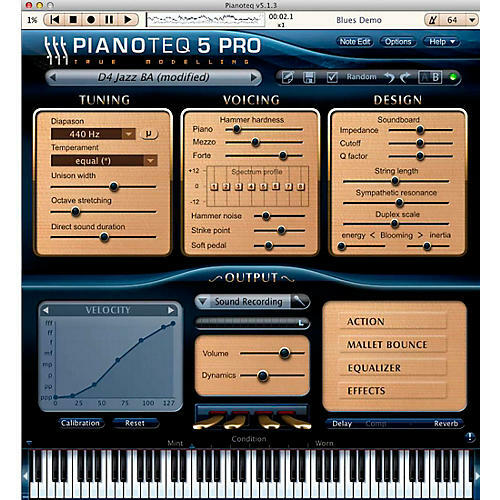 The audio demos below were created using the available presets in Pianoteq 6. No external instruments, effects or audio processing are applied unless noted. To achieve the best possible listening experience, we recommend that you use high quality headphones or loudspeakers with a volume similar to what you hear when standing next to an acoustic piano.